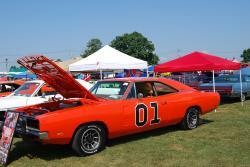 Carlisle Chrysler Nationals is the largest all-Mopar themed swap meet and car show in the world! The event, held July 14-16 at the Carlisle Fairgrounds, hosts 3,000 vehicles from all eras of the Chrysler brand, including classics, muscle cars, high-performance new models and more. Highlights include the enormous showfield that is organized by year, make and model, special indoor displays, activities for the kids, industry guests, and special prizes. Get two shows for the price of one! The Hurst Nationals will take place simultaneously across the street at the Carlisle Expo Center. Approximately 350 vehicles will gather for this milestone event, including all makes and models of cars produced by Hurst. Stop by the free Thursday evening kick off event at the expo center featuring food, music, over 400 cars and more. Enjoy special displays celebrating the 100-year anniversary of Dodge and RAM trucks, the GTX 50th anniversary, the Golden Commandos and Ramchargers reuniting with 1964 Race Cars, and the Panther Pink & Moulin Rouge (FM3) paint colors. Be Part of the world’s largest all-Mopar swap meet. Vendors range from the biggest sellers of original, NOS and reproduction parts to hobbyists with a few leftover parts for sale. Take in an educational session with topics like restoration techniques, care and maintenance, engine building and most recently, how to choose the right oil for your Mopar. See what your car can do on the Carlisle Course with a Real Street Shootout on Friday evening. Find more info and plan your whole weekend here.